The wispy white flower clusters of common fringetree add a delightful haze to the spring garden. 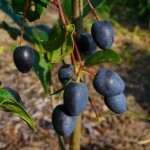 This native to the southeastern United States is a hardy deciduous large shrub or small tree that naturally inhabits moist woodlands. It covers a broad range of distribution, from New York State to Texas, so it is best to plant from regional stock. When mature, the common fringetree develops an irregular, spreading crown. Its leaves are oblong and medium green with varying degrees of glossiness. 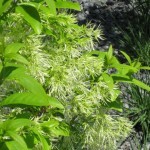 The lightly fragrant, feathery white flowers appear in mid to late spring before the leaves fully emerge. Plants are either male or female, or dioecious. After pollination by bees, the female trees form clusters of small waxy dark blue fruits that are eaten by birds. The foliage turns muted yellow-brown shades in fall. 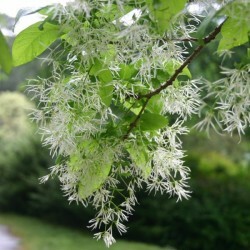 Grow the common fringetree in full sun to partial shade and acid to neutral soil that’s moist and fertile. It blooms on one year old wood, so be sure to only prune after it flowers. Otherwise, you may prune off next year’s flower buds. In cold regions it grows more slowly and adopts a shrubbier habit; where winters are mild it becomes more tree-like. Fringetree has few pest and disease problems but is favored by deer. Germination 1. 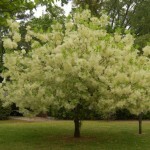 Soak the fringe tree seed in a bowl of water for 24 hours. This will help to soften the tough outer coat of the seed, preparatory to germination. 2. Moisten the peat moss and wring out any excess moisture. You will need enough peat to completely envelop the seed, generally twice the seed's volume. 3. Place the bagged seed in the vegetable compartment of the refrigerator and allow it to sit for 60 days. This is a common seed germination technique, used to break a seed's dormancy, known as cold-moist stratification. 4. Check the moisture content of the peat periodically. If it begins to dry, spray it with a misting bottle so that it is moist, but not soggy. 5. Fill a planting pot with a mixture of equal parts of perlite, sand and compost. Water the soil and allow the excess water to drain from the bottom of the pot. 6. Plant the seed 1/2 inch deep and cover it with soil. Place the pot in an area that receives light, but not direct sun. 7. Water the soil to maintain a moist environment for the seed. Using the misting bottle to mist the soil will help you to keep from overwatering it. Allow the sapling to develop. Never let the soil become soggy. 8. 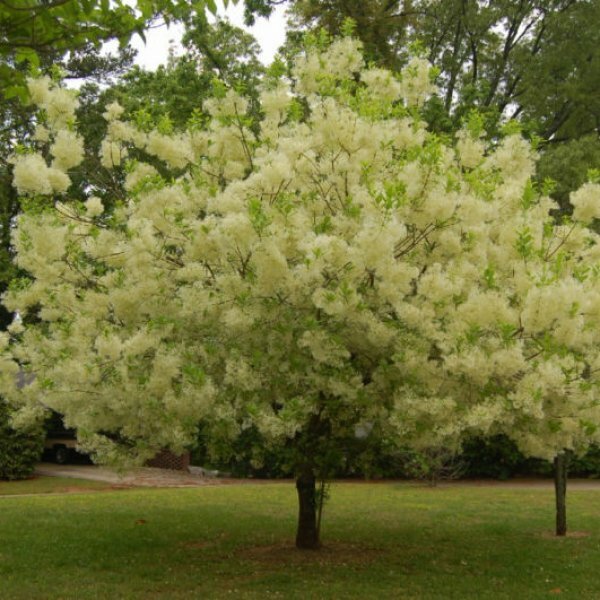 Choose a sunny area of the yard in which to plant your fringe tree, and wait until after your last frost to put it into the ground. 9. Dig a hole the same depth and twice the width as the pot in which the sapling has been growing. Place the sapling's roots into the hole and backfill with soil. Water the soil until the water puddles. 10. Water the fringe tree when the top two inches of soil become dry.